Ben Stiller leads an all-star comedy cast, including Robin Williams, Owen Wilson, Rebel Wilson and Ricky Gervais, for the final, fun-filled Night at the Museum! 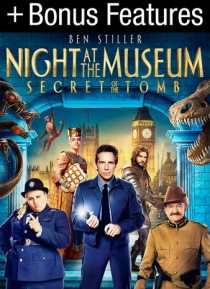 This time, Larry Daley (Stiller) and his heroic friends embark on their greatest adventure yet as they travel to London in order to save the magic that brings the museum exhibits to life after dark. Includes bonus features.